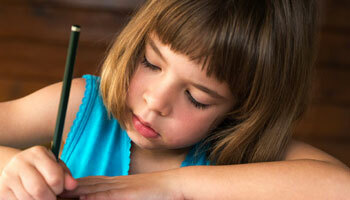 Children’s writing development tends to parallel their development as readers. Print awareness develops in young children as a result of being read to by adults and having other literacy experiences. Part of print awareness is the realization that writing has meaning and is created with instruments such as pens, pencils, crayons, and markers. Children begin to imitate the writing they see in their environment. At first glance, the efforts of a young child may look like meaningless scribble, but a closer look at these early attempts at writing will reveal something more. Children who have not yet entered school engage in scribbling as an attempt to create writing that has meaning. For example, when three-year-old Lexy misses her daddy, her mother suggests she write a letter to him. Here, Lexy takes a pencil and creates a "scribbling" effect on the page. When her mother asks her to read the letter, Lexy points to the page and says, "I love you, Daddy." Lexy already knows that print carries meaning, even if she cannot yet correctly spell, write, or recognize words. As with reading skills, the early writing described here grows through explicit instruction. Typically, the goal is not to "write the way you talk." As such it does not develop naturally. Writing is a skill with rules and structures. Across multiple grade levels, good writers are created through systematic, explicit instruction, combined with many opportunities to write and receive feedback. Writing may be the most complex process that we expect our students to learn. To write well, students must develop a broad set of skills. Basic writing skills: These include spelling, capitalization, punctuation, handwriting/keyboarding, and sentence structure (e.g., elimination of run-ons and sentence fragments). Basic writing skills are sometimes termed “mechanics” of writing. Text generation: Text generation involves translating one’s thoughts into language, what might be thought of as the “content” of writing. Text generation includes word choice (vocabulary), elaboration of detail, and clarity of expression. Writing processes: Especially beyond the earliest grades, good writing involves planning, revising, and editing one’s work. These processes are extremely important to success in writing, and increasingly so as students advance into the middle and secondary grades. Writing knowledge: Writing knowledge includes an understanding of discourse and genre — for example, understanding that a narrative is organized differently than an informational text. Another example of writing knowledge includes writing for an audience, that is, the writer’s understanding of the need to convey meaning clearly and appropriately to the people who will be reading a particular piece of writing. Learning to write well is challenging to most students, but students with reading difficulties often have particular difficulty with writing. Underlying weaknesses that affect reading — such as limited vocabulary knowledge, lack of understanding of text structure, poor phonemic awareness, lack of letter-sound knowledge — typically affect writing as well. In addition, poor readers usually do not read widely, which deprives them of useful models for writing. Finally, if a child’s reading difficulties are severe, so much time and effort may have gone into providing reading intervention that writing instruction may have gotten short shrift. Literacy expert Steve Graham talks about what the research says about the most effective practices in teaching writing. The first observation: kids need many opportunities to practice their writing.